Mandala zentangles, to me, are easy, intuitive, and very relaxing to draw. 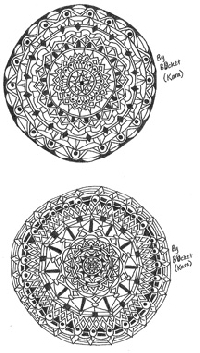 For this swap you will create 1 mandala-style zentangle for 1 partner. Zentangles should be the usual 3.5 inch x 3.5 inch size and on cardstock/heavy paper. Zentangles may be black and white or color, sender's choice. THE DETAILS: All swappers in good standing are welcome. 4.95 rating please, PM if you have a compelling reason to be below that level. Flakers will not be tolerated and the usual swap-bot and Zentangle group rules and standards apply. I have a question. Is a mandala zentangle always in a circle? Is that how it differs from a regular zen? Thanks for answers. Do the always have to be symetrical? Mandalas should technically have "radial balance." This means that all elements radiate out from the center of the circle. This does not necessarily mean that they will be symmetrical - it just means that the center is the focal point and all elements of the mandala lead your eyes toward the center. Hope that helps, @daisygirl ! Thanks!!! I am going to try my best! Hope I get it right! personally I have seen all sorts of mandalas = some symetrical - some not.. some leading to the center .. some not..
Just one more day to wait chickadeebijoux! I'll do one last run-through of the swappers tomorrow sometime and then assign partners. Happy to have such a big group for this swap!